Coverage of Dragon*Con 2009 continues here! I’ve already recapped Friday and Saturday, so today will cover Sunday and Monday. If you’d like to see over 600 pictures I took at the event, you can view them on Flickr and THE UNIQUE GEEK photo gallery. After going to sleep around 5am the night before, we all slept-in on Sunday morning. Eventually I awoke, cleaned up, and got in line to see Patrick Stewart. Yes, THE Patrick Stewart! 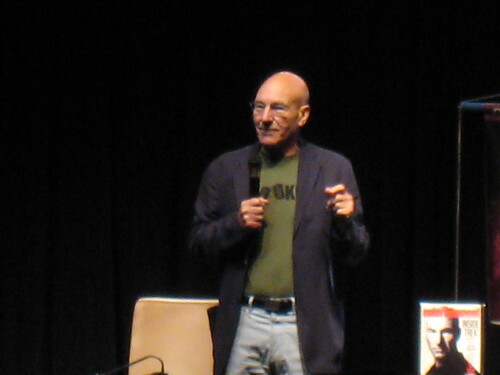 Patrick Stewart, as in Jean-Luc Picard from Star Trek: The Next Generation. Patrick Stewart, as in Professor X from X-Men. Patrick Stewart, as in the famous Shakespearean theatre actor. Patrick Stewart, as in teh awesome! I waited in line for about 80 minutes with the Methvin clan for the Patrick Stewart panel. We were in another one of those lines that stretched outside and wrapped around the block. Surprisingly, even though I was around the block, I was only number 400 in line for a room that holds 1,500. Just before showtime, we got into the room and scored great seats. Patrick Stewart was wonderful! From what I’ve heard, he doesn’t do a lot of conventions. Based upon his apparent nervousness and unrehearsed stories, I’d guess that was true. I’m really glad his stories were unrehearsed because they sounded a lot more genuine that some celebrities at conventions. He talked at great length about his time on Star Trek, mostly focusing on experiences he had during filming (rather than about the stories themselves). I waited in the Q&A line, unfortunately they didn’t get through many audience questions. So I returned to my seat about 15 minutes before the end of the session saddened that I didn’t get to ask my question. Then surprisingly Patrick Stewart seemed to fumble while trying to answer someone else’s question. After a really protracted pause by Stewart, I saw the opportunity to ask my question from my seat (without the benefit of a microphone). The question Stewart was attempting to answer was something like, “What things did you enjoy while filming Star Trek?” He seemed to have run out of things to say on the subject and was pausing quietly on stage. So I took it upon myself to fill the uncomfortable silence and yelled out my question with my loudest stage voice, “What about the dune buggies?” I wanted to ask this question because in the movie Star Trek: Nemesis, Patrick Stewart genuinely looks like he’s having the time of his life during the dune buggy scenes. My question from the audience caught Stewart by surprise, but it was apparently a pleasant surprise. His face lit up at the mention of the dune buggies! He then made a joke about the audience leading him by the elbow (which I was pretty embarrassed about, deservedly so). Next he went on to talk cheerfully about filming the dune buggy scenes for about ten minutes. In fact, someone tried to change the subject and he responded with, “I’m not done talking about the dune buggies.” PATRICK STEWART LIKED MY QUESTION! Hooray! I guess I was thrilled with this because celebrities have usually heard just about every question. It’s rare to catch them off-guard or, even better, to excite them with the subject matter of your question. Overall, Patrick Stewart was an amazing guest and a real joy to listen to. I’m not sure how many opportunities I’ll have in my life to see him, so I’m really glad I did. Next up was lunch with an internet buddy of mine, Adama. Adama runs the Green Arrow blog, Dispatches from the Arrowcave. This was the first time we’ve met face-to-face. I’ll detail this meeting more in a future post over at my other blog, FIRESTORM FAN. While all this was going on, I missed out on the DC Comic cosplay photo shoot. While I didn’t get any pictures of it, thatdjspider on Flickr did. It looks like it was truly amazing! I did a little shopping at the Tales of Wonder booth and picked a couple amazing deals. First up was Marvel’s Hulk Visionaries: Peter David volume 1 which normally retails for $19.99, but I got it there for $6. 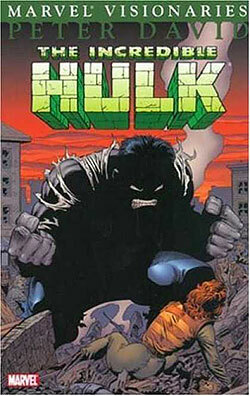 This trade covers Peter David’s earliest Hulk issues with art by Todd McFarlane. I’ve never read these issues, so this was a real steal! Next up was Dark Horse’s Star Wars: A Long Time Ago… Volume 5 which normally retails for $29.95, but I got it there for $15. 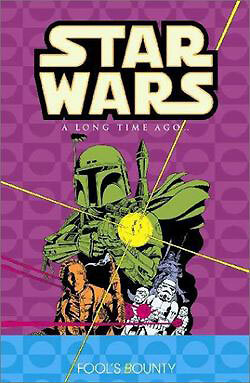 The A Long Time Ago… series of trades reprints the original Marvel Star Wars comic. I’m a huge fan of the old Marvel run and have been slowly picking up these trades. Sunday evening was the night for THE UNIQUE GEEK Board of Directors dinner! This is basically a chance for all those that participate in THE UNIQUE GEEK to get together and hang out. It’s open to anyone who participates in our listserv, listens to our podcast, or that we find randomly wandering the streets. 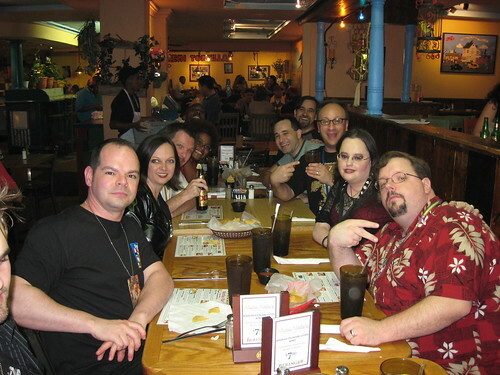 This time 21 of us descended upon a local Mexican place to cause havoc! We had good food, lots of booze, and lots of laughs. The gang included: Serv, Doctor Jen, Jon, Choco Taco, Damian, Leigh, Rox of Spazhouse, Scott C, Eli, Jemma, Jamin, Ron, Holly, Race, Erika and her husband John, Ravenface, Shockwave, myself, and Michael Bailey and his wife Rachel. Shockwave’s spouse made her annual brief appearance decked out in her Cobra Baroness costume! 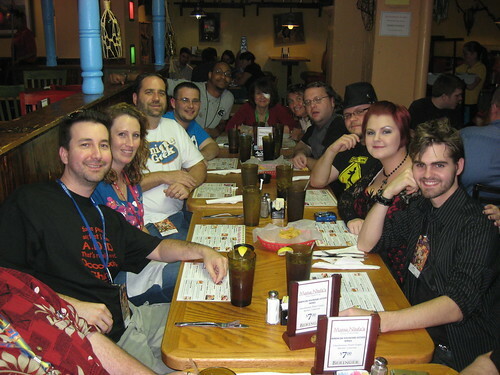 Below are a couple pictures from dinner. Again, visit Flickr or THE UNIQUE GEEK photo gallery for a great deal more photos from dinner. After dinner (and working out everyone’s share of the bill using differential calculus), we headed off to play late night games. We played several rounds of Werewolf (also known as Mafia or Assassin) into the wee hours of the morning. This game is becoming a DragonCon tradition for us! Another tradition is for our game moderator to become completely wasted! It makes the game more interesting, trust me. We were joined (unwillingly for us) by a freshly-turned 18 year old girl in full Michael Jackson zombie make-up. She didn’t exactly gel with the crowd, so we soon dispersed. We wandered the hotels for a while and eventually settled in a room party. Sometime around 3am (I think) we finally crashed. Since I had an early afternoon flight, Monday was really a day for goodbyes and last minute shopping. Back at Tales of Wonder again I picked up another great bargain. 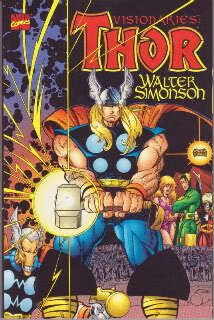 Thor Visionaries: Walter Simonson normally retails for $24.95, but I got it there for $5. I’ve never read these issues, in fact I’ve read very few issues of Thor in my life. However, Walt Simonson has never disappointed and I’ve heard rave reviews of these issues. Can’t wait to jump into this book! 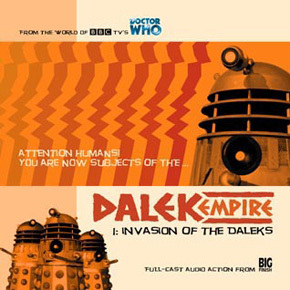 I also picked up the Big Finish Doctor Who spin-off audio adventures Dalek Empire at a reasonable discount. I picked up the first four disks for $40. This is one of the few Big Finish Doctor Who spin-offs I haven’t picked up. Given the discount, I just couldn’t pass it up. That wraps up my on-site coverage of DragonCon 2009. 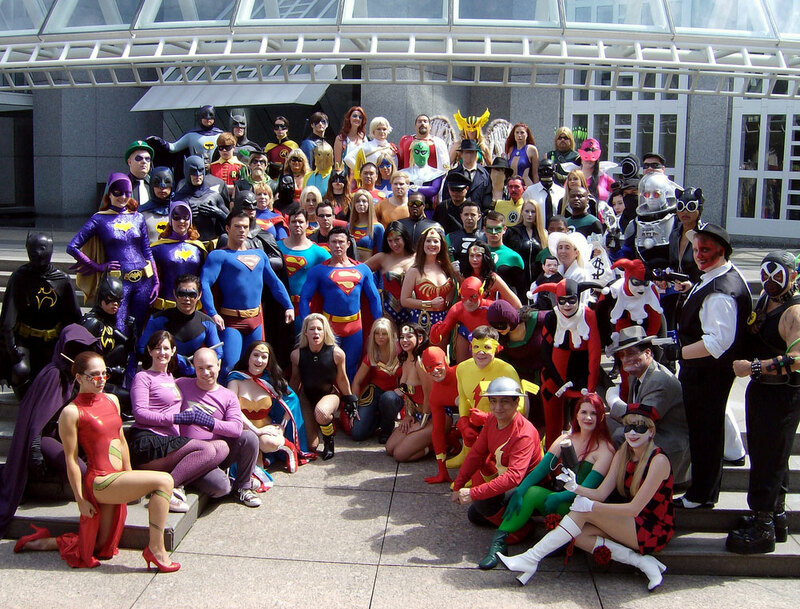 Come back tomorrow when I’ll feature the best of DragonCon 2009 costumes!